This article was originally published on the Evergreen Outdoor Center blog on October 30, 2005. There were a few things during the avalanche courses that surprised me. One major surprise was the lack of search and rescue sense seen on day 4 during a simple rescue scenario set up instructor Nic Seaton. I know that he too was very struck by the results of this scenario, especially because it was done by a group of mostly guides. The beacon work was very fast, but the precautions to be taken were not thought out and the lack of system used to search for the non beacon-wearing victims was discouraging. Another thing, that is perhaps cultural, was the lack of interaction between students and with the instructors. This could have also been a language barrier, in the case of student to instructor interaction, yet was unfortunate as the students had a huge well of knowledge at their disposal if they would have been more participatory and inquisitive. 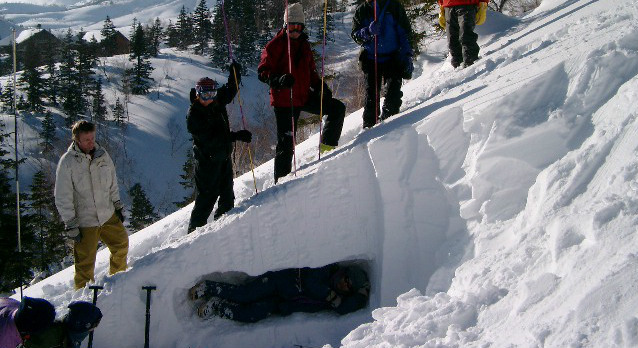 In future avalanche courses it may be wise to leave little to assumption and provide detailed step-by-step how to lectures and field demonstrations. One main reason for confusion on this course was because not many of the students had participated in a RAC course, which is a prerequisite in Canada. The students here may have taken part in another seminar, yet the procedures and teaching styles are very different between Japan and Canada. The final two days were the exam days both written and field. The field exam started with each student doing their own snow profile, a total of 18 profiles is definitely a sight to see. The range was great, from some of the most well crafted pits I’d ever seen, by one of my RAC students, to very thoughtlessly crafted and inadequate profiles. Yet on the whole they were on par with Canadian students. The afternoon session consisted of the beacon test and weather taking examinations. The student is allotted a total of 5 minutes to find two beacons with in a 35 x 35 meter area. The fastest times were around 2 minutes and unfortunately one of the students did not pass this mandatory portion of the course which was very hard for the instructors to see as they truly want all participants to pass the course. The weather-taking component went very smoothly and all participants did well in this part of the exam. The unfortunate thing is that there are very few places in Japan, common place at most other international ski hills and highways study plots, where these type of weather stations are set up to give twice daily weather observations, which will not allow for students to further practice this. The last day was the written exam and the final lectures by the instructors on terrain, organized rescue (which is not tested) and a very sad but enlightening case study and discussion presented by John Buffery of an avalanche rescue that he was involved in. This case study left the class a sense of challenge and commitment to try to make the winter mountains a safer place through their participation in avalanche awareness, forecasting, control and in the case of an accident, rescue. The Japanese mountain community and the newly formed JAN have embarked on a long and turbulent road to their common goals of – increased avalanche awareness, professional level avalanche courses and the development of a reliable and respected community of avalanche forecasters to provide avalanche bulletins for the winter mountain communities of Japan.